Shri Uttaradi Math, the seat of Jagadguru Sri Madhvacharya, provides yearly Panchanga in Telugu, Kannada, Marathi, and Sanskrit. 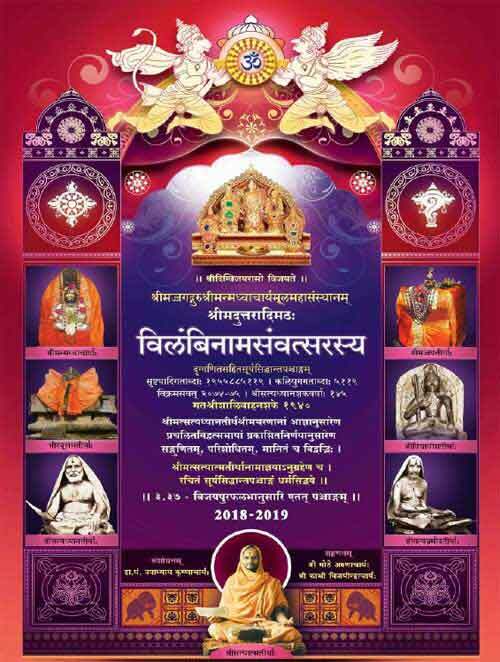 The Panchanga for the year 2018 – 2019 (Vilambi Samvatsara 1940) has been released by Uttaradi Mutt. These Panchangas are sought by devotees around the world. You can download them for free in pdf format. The 2018 – 2019 Panchanga is from March 18, 2018 to April 5, 2019. You can get details about all the Panchanga published by Uttaradi Mutt here at the official website. Login in needed - You will need to register by providing mail id, name and mobile number for free download. Once registered again click the above link again or refresh the uttaradi mutt page to open the panchangas.